Our adventure began in the chaos of Mumbai – always a shock to the system, but the edge was taken off as soon as we arrived at beautiful Abode. Funky, cool and unique are not words that you usually associate with Indian city hotels, but this is an absolute gem and it bookended our trip perfectly. 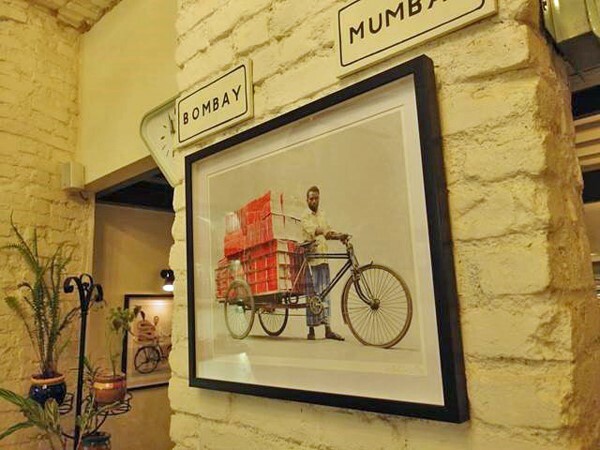 It’s right in the eye of the storm, with Mumbai’s classic colonial sights all around, just a stone’s throw from the Gateway of India and surrounded by bars and restaurants. 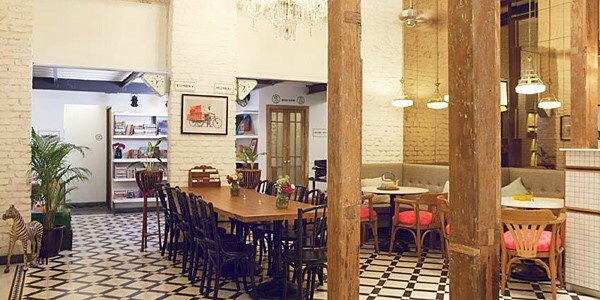 It’s located on the second floor of an old merchants’ building and the staircase guides you up into the impressive café/chill-out area, which has double-height ceilings and clever décor that mixes classic Indian style with funky twists. 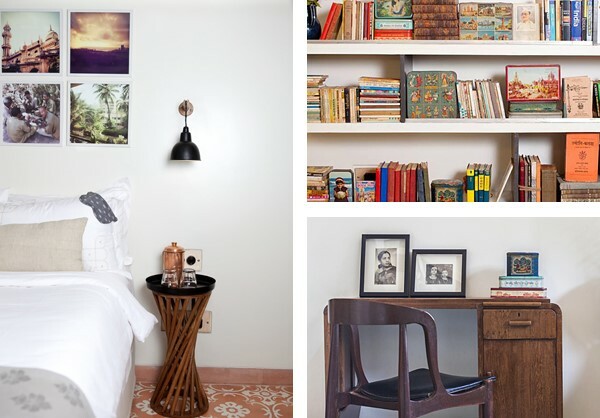 I met the owner’s father, who’s a retired antique dealer; the furnishings are the fruits of his lifelong passion for collecting items from all over India. Leading off in all directions are the rooms – we stayed in a Superior Luxury with a beautiful seating area and roll-top bathtub. At the other end of the price spectrum, the Basic rooms all enjoy the same features and furnishings for incredible value. We loved trawling the local bazaars and ticking off the sights in colonial Coloba. And we headed off on a memorable daytrip to Elephanta Island with its UNSECO-listed cave temples and all the oddities that come with a popular weekend destination for locals (roaming cows, monkeys, goats, donkeys, tin trains and food shacks galore). 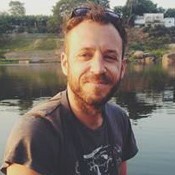 After a few days we were happy to escape the open-air sauna that is Mumbai and jump on the night train down to Goa for some much-needed sea breezes. We hopped between beaches, explored villages on motorbikes and ate lots of wonderful seafood curries. And then we hit the dream: The Beach Houses. 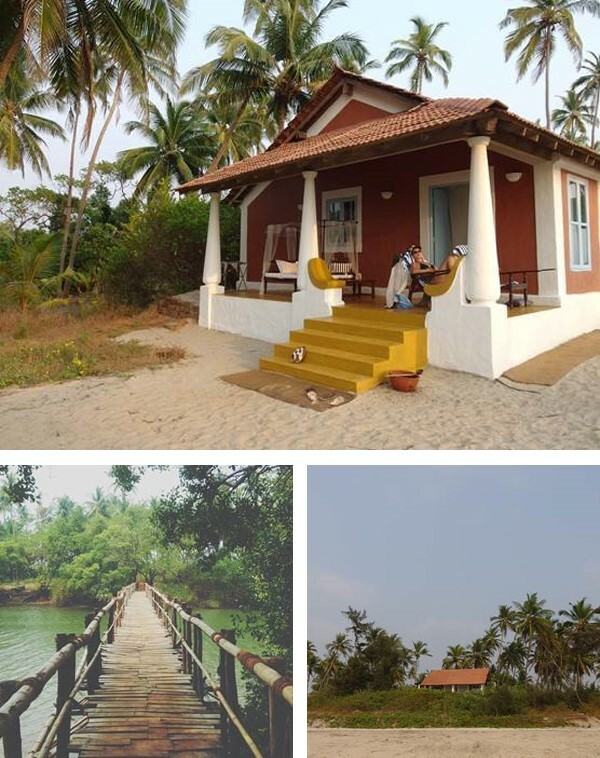 This restored trio of Portuguese dwellings for 2-6 is reached over a wooden bridge spanning Otter Creek, and on arrival you enter a little world of Goa au natural. We happily settled into its languid lifestyle. 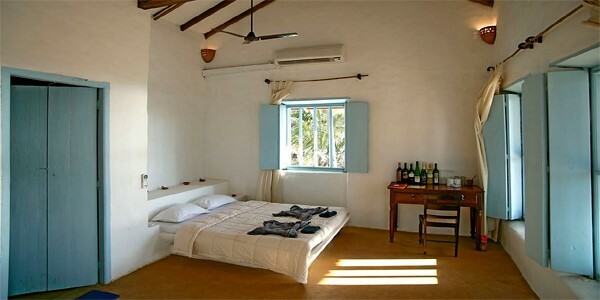 We stayed in The Bakery, a beautiful pastel-hued building set amidst the coconut groves, with killer views of an unspoilt stretch of private beach. Our time was spent watching the fishermen haul in their boats, lazing in a hammock, and stargazing by night. 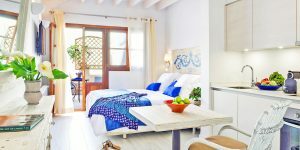 The rooms are airy and light, with a refined beach-house décor, and there are no mod cons (bar, air-con) – but that’s the beauty of the place. Butterflies flutter, birds tweet and creepy crawlies crawl. It’s good for the soul! You can see why it attracts a famous clientele (e.g. Brangelina) – security is tight and privacy is paramount (there are 2 security guards per guest, not for safety but to keep pesky prying eyes at bay!). It provided me with delusions of grandeur for a brief couple of days – I’m usually on the wrong side of the fence. 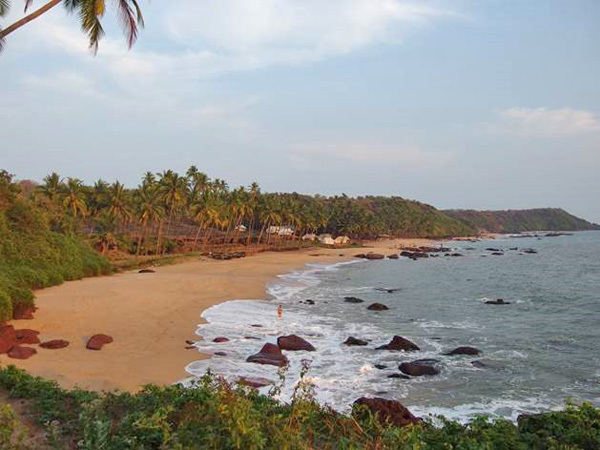 I can see why most people don’t tear themselves off the beach in Goa – it’s easily done as the days slip into weeks. But if you can muster the strength (and I implore you to! 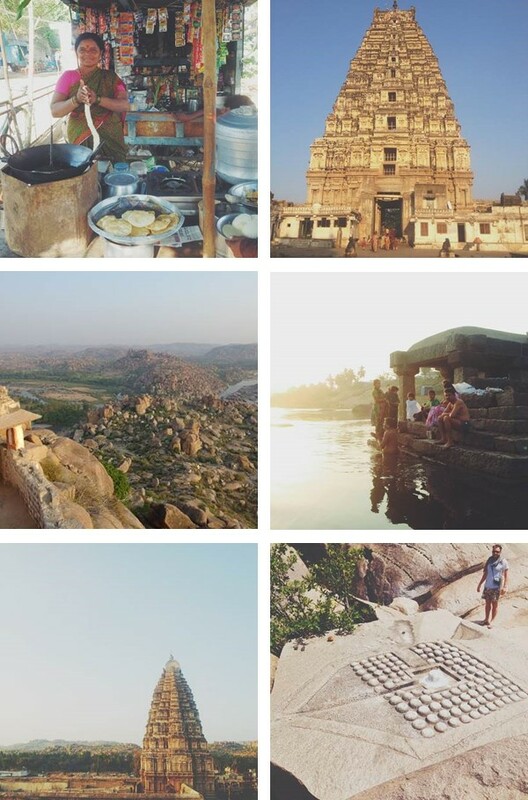 ), you won’t regret the decision to take a couple of days out, fold up the hammock and jump on a train inland to Hampi. 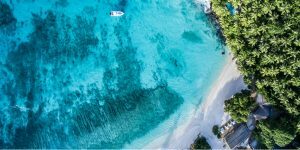 Spread out over the most magical boulder-strewn landscape are temples, ruins and carvings from a long-lost civilisation, with a sparkling river that attracts colourful birdlife running right through it – you just couldn’t make it up. This really is India at its most atmospheric. We spent many happy days exploring temples, swimming and breathing in the local atmosphere. Just sitting by the water with a chai for a few hours, we saw more odd sights than you would see in a week anywhere else. 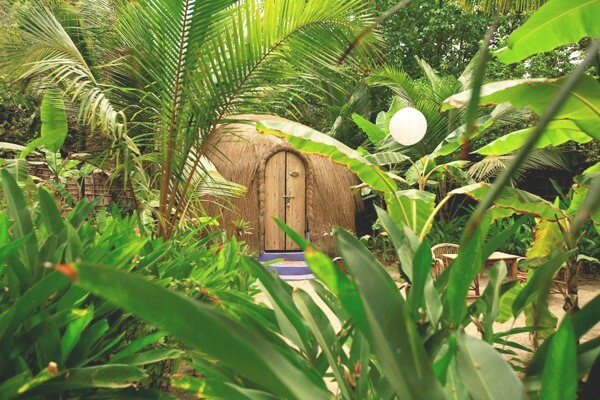 From Hampi we headed back to the coast for one last beach blowout at Yab Yum – a bonkers place with huts that look like coconuts from outer space. The gardens are magical, with disco balls and lightshades hanging from the trees – I wouldn’t have batted an eyelid if a fairy had popped out of the undergrowth! It caters really well for families, and the kids we saw looked like they were having a ball.